What I am wondering is to what extent Onyx will support the Note with upgrades. For the older E-Ink devices running 4.x.x, the story was that the hardware could not support an Android version newer than 4.4.2. Now, with upgraded hardware, in theory, Onyx could upgrade the Android version in future firmware upgrades. Whether they will - that's the big question down the road. For now, though, it's great. Yes, it handles pdfs and the markups very well. We are promised greater dual-window features in the next firmware update. The stylus is quite good on the native Note app. It isn't so good on OneNote, or any other third party app, or so I am told. The Word and Outlook apps work well, I think. The Note might not be able to replace a Samsung Galaxy Tab or an iPad, but it can do more than E-Ink devices of yore. Still, the bottom line for me is that it allows me to work with Logos/Verbum in E-Ink mode. Very helpful video. I am thinking of getting one primarily for reading, passage guide, and some word study. Looks like it does all that very well in e-ink. I am impressed. That's pretty much how I use Logos/Verbum. The Note gives me, easily, the best E-Ink Logos experience yet. This was my primary reason to buy the Note. As a bonus, I find that the Note does a good job with Gmail, Outlook, and even the Word app. It is a great size for pdfs. I haven't used the note-taking ability very much (it comes with a stylus), but that seems to work well. Overall, the Note is the best E-Ink device for Logos that's out there. Onyx also has the Max 2, which has the same hardware as the Note, but in a 13.3 inch display. I thought that might be a little too big for me. It's also more expensive. If someone wanted to use the Max 2 as a second monitor for their desktop/laptop, then it might be worth it. I'm still very pleased with the Note. The Note is now available on Amazon, for anyone who is interested. And no, I don't get a commission if you buy one! Just pray for me. Another E-Ink option, less than half the Note's price, for anyone who is interested. See it here. This device does not have Play Store and does have some ghosting issues in some apps. However, Boyue promises that an October update will address both issues. Having researched and investigated e-ink options for a long time now, I'd say this device is the most promising one ever. It can even play audio. A little disclaimer - I received mine yesterday. Amazon emailed your question about adoptable storage. Good question. I forgot about that 6.0 feature! Yes, the Mars supports it. I'm in the process of moving data now. I may end up selling my Note if this Likebook Mars turns out to be as good as it seems so far. If you manage to install Logos on adoptable storage, please share here. I'm just holding my breath, ready to order the device. By the way, non US residents can get it here (or US residents who don't mind importing from China themselves). From my experience, import fees in Europe would be around $60. I already had Logos (Verbum) installed before the data move. Once the data was moved to the SD card, I needed to reboot the Mars. After that, everything worked exactly as before. Performance is like my Note, and much better than any previous E-Ink device I have tried the Logos app on. And the Mars has backlight and the SD card slot, both of which the Note lacks. The soft backlight option is quite nice. As I mentioned before, there is some ghosting when I turn pages or change screens in Logos (and other third party apps). That should be fixed, I am told, by a firmware update in October. Just be aware of that if you buy soon. Not sure how ordering from AliExpress would work in the US given the tariff situation now. But ordering through Amazon makes it easier to return the device if there are issues with it - at least in theory! But I have been impressed with the customer service from Boyue/Likebook. Cant be worse than my super old Onyx device, that's still running Android 2.3. It's not available on the European Amazons. It would be easier for me to order on Amazon.com instead of Aliexpress, however, Amazon.com has been accusing me of conspiracy and fraud, so I avoid buying anything from them as far as possible. The ghosting isn't bad at all, but some folks could find it annoying. Hence my warning. By tapping the icon that toggles A2 mode on and off, you can do a manual refresh as desired. This ghosting is the only negative thing I can say about the Likebook Mars thus far. The size is good, the hardware is great. A cover is included as well. Battery life seems to be along the lines of other Android E-Ink devices. It runs Logos/Verbum well. I may do a video of the device running Verbum, if anyone would be interested. Where did you get the Logos/Verbum app for sideloading? I don't really want to go through the PlayStore (even after the software update) as the Google services are probably a bit of a battery drainer. My unit should arrive in the next few days. I'm already looking forward to it. I have an Android tablet. I used the Amaze file manager to make a backup copy of Verbum. Then, I copied that app to my laptop, and finally from my laptop to my Likebook Mars. That's how I came up with all the apps I installed on the Likebook. Another alternative - you could install the Amazon app store on the Likebook. The Logos/Verbum app should be available there - it used to be. I just researched and found my own answer from last year. Hmm. 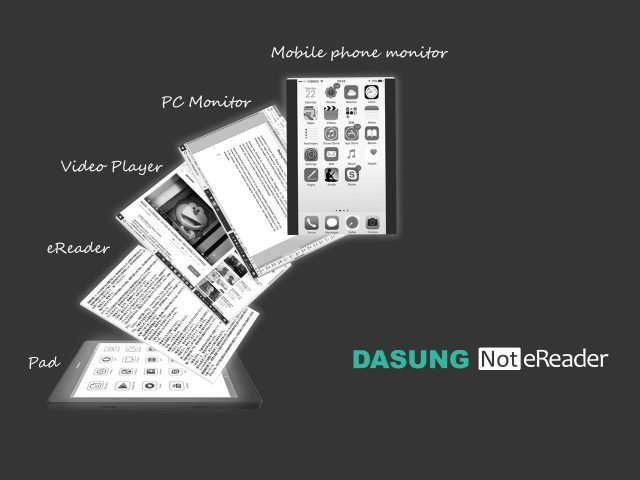 The Dasung NOT eReader. Didn't think that one through. Onyx is supposed to release the Nova before the end of the year, but no definite date has been announced. Similar specs to the Likebook Mars, IIRC. Probably a similar price, too. The Dasung looks promising, but I'll pass on the crowdfunding campaign. Show me the actual device, out there and available for purchase, and at a better price... and then we'll see! Too many people have been burned by crowdfunding campaigns. I'm liking my Likebook Mars more and more. It handles the Verbum app very well. Once Boyue fixes the auto-refresh glitch, we're good! One wonders if it's appropriate to read Biblical literature on such a device - given the phonetic sounding of the name. Does anyone know what kind of parental controls are available on these devices?